As a news outlet known for sharing news about record-shattering, vat-filling, massive frozen espresso drinks, it’s a cool and refreshing change of pace for us to share news about a new tiny Frappuccino. If you live near Houston or Denver and want a caffeinated confection with fewer calories, you can check out the test. Why would they do such a thing? Espresso drinks and brewed coffee are already available at Starbucks in an off-menu “short” size, and the chain’s blended cold drinks are known for being both packed with calories and expensive. 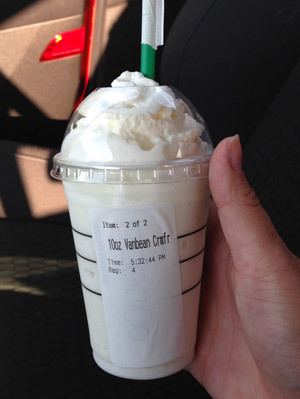 (That’s why drinks attempting the apparent world record are based on the Frappuccino: per ounce, it’s pricey.) Adding these new items to the menu lets Starbucks market a “new” product without having to add new product lines. They just need to order some little cold cups and call it a day. The lower price point potentially creates ‘trial’ – customers order something they wouldn’t normally, and then later think, “Next time I have to order the larger size”!